I presume that many will be asking this exact question based upon the availability of variety of platforms available for you to use, then why to choose Joomla? I would even recommend you to reconsider Joomla if you have ever used it earlier in your lifetime. A lot has changed in Joomla over the time my friend, a lot. Todayâs Joomla family is standing tall and strong holding each otherâs hand, just as any family evolves. Please consider - it is an international family that I am writing about. The thing that mostly connects and impresses me in Joomla is its synchronized development process. Each and every developer and enthusiast from around the world is constantly kept in the loop. Any suggestion is always heard as well as considered by the community. What I love in Joomla? I have complied few awesome points that make me love Joomla more and more, day after day. The most beautiful point being, that these points are already implemented considering the upcoming future trends of the Internet and the Joomla community. Joomla is Responsive - Hell yeeeah, itâs the best thing to happen in Joomla. It has shifted base towards mobile friendliness. Staying up to the current trends of increased mobile usage traffic Joomla is also responsive now. Joomla adopted the Bootstrap framework to easily slide into the mobile friendly dimensions with responsiveness offered to both its frontend design and administrator interface. When I first heard this feature in Joomla it was like a dream come true to me and my team. As at that moment we were trying very hard to impart responsiveness to PayPlans and our other products but results were very disheartening prior to Joomlaâs switch on the responsive side of the web. Direct install from Web - Another new feature added in Joomla 3.2. Really speaking it saves a lot of my time while maintaining my website. It provides me the entire JED interface at the backend of my Joomla website allowing me to easily find out the best suited product for me on JED and then install it then and there without any hassle. You may also like see the video of its working and easy flow. Joomla is more secure - The ultimate nightmare of any digital user is his compromised online security. I am very glad that Joomla took a very stern step in integrating new security measures. 2 Factor authentication - An in-built Joomla 3.x security feature added to the security arsenal. This feature is determined to thaw all the efforts of security breach by the use of any unauthorised access or hacking into the password security. Every time a login attempt is made 2FA generates an temporary code send to your mobile phone and by entering it only you are allowed access to the admin section in the backend. We have also developed this feature which is compatible for the Joomla 2.5 users. Bcrypt Algorithm - This is the latest hashing algorithm used by Joomla to scramble all the passwords in your database. Ensuring a better encryption and a hard to crack situation for any hacker. Bcrypt hashing algorithm is based on the Blowfish with a small twist. Multilingual right from the start of installation & Easy language overriding - The more I think about the goodness of Joomla and write, the more I feel the love bond to grow on me. Joomla has thought about almost every aspect for the easy usability of its users. Joomla allows you to install itself in a language of your choice, considering our home planet which is a mix of numerous cultures and dialects. Moreover the language overriding techniques in Joomla is a wonder which allows you to change the text as per your likeness without the need for any coding. Instead of me explaining and you brainstorming my words just allow me to show you the easiness of overriding languages in Joomla. Joomla handles the contents professionally - Being into the blogging and content writing business this feature has saved my day many times. It allows me to save multiple versions of my blogs and let me venture out in the revision histories to bring out the perfectionist in me âº. If you have not used this feature try it out to maintain your blogs, documents even company policies. It will provide you a compiled versions of all the changes you brought about in any written content and allow you to reflect on the changes. You may learn in detail about how to get it started on a beautiful blog written by Joomlart. Joomla shifted from Mootools to jQuery - This is one of the topic that got us excited. Its a burning topic and can spark lots of arguments amongst the fans while comparing between both the frameworks. All I wish to say the the world has moved on and the developer now loves to use jQuery. jQuery has better mobile support than Mootools. It is widely available in comparison to Mootools. jQuery hosts hundreds of plug-ins in compared to Mootools. jQuery has an Official UI library! - Mootools doesnât. Based on our personal experience I can say that jQuery is easier to learn when compared to the Mootools! You are never alone - If ever you feel lonely or left out while coding your way in the digital world just jump in the bandwagon of your nearest Joomla Day. It will recharge you will all the knowledge and kill all the boredom you felt. 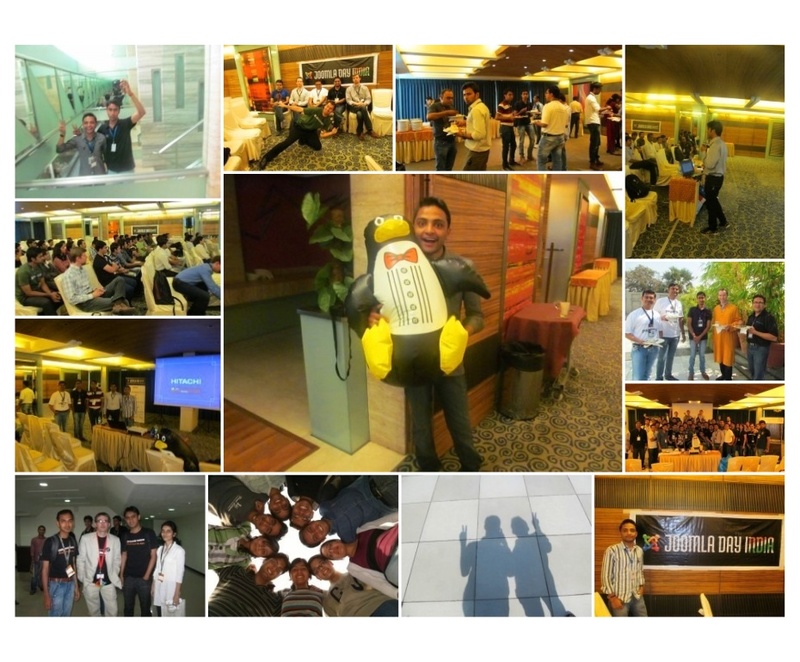 When I first attended the Joomla Day Mumbai in India it was then that I felt the power of the community, the power of being myself. I was overwhelmed with the joy of the familiar greetings from the persons whom I had only met virtually. Now, they were there in front of me live and in flesh. It was awesome. Just join in the community, share your experiences, gain new perspectives and indulge in merry making âº that is what a Joomla Day is all about. Joomla Stack Exchange - The just above point justifies that, â The power of Joomla arises from its community and its family members â. The basic motto of Joomla is, âYou are Joomla!â. To incorporate any change you need not to wait for any new release or legal authorization. You need, you create it, you use it. Completely based on this Joomla has recently acquired a domain for exchanging information amongst its family members. Just have a look at the page and you will see many many queries asked as well as answered. All the answers are completely vote based it means the best answer tops the chart and its writer enjoys the laurels and prestige. So, I request everyone to contribute and share on it, answers or ask questions both are invited. Joomla is truly open source - Joomla being an open source frontier took it one step further by switching from SVN to GitHub. If anyone is unaware, let me inform that both of these are code management systems. The later being more true or close to the Open Source spirit. The extensive use of Github allows everyone on the planet to contribute easily in the development of the Joomla source code. It means that every single person on earth can view the actual source code of Joomla and contribute new changes as well as new features to it. Joomla is not limited to CMS - Joomla has its own framework allowing the advanced users to create there own system independent of the protocols of the CMS. Using the framework enables you to define the structure and the logic of the applications. Framework is a privilege for the advanced users or developers allowing them to design their apps specifically for the projects - so there is no redundant code and freedom to do anything you want. So, considering all the above points (which are not the only ones) I tried to explain - Why Ready Bytes love Joomla? Why everyone should love Joomla?...... because it allows us to see the future. It allows its users to know where it is going and what can be expected from the community. Lots of possibilities are opened every time a new release of Joomla is published. New concepts are there to explore new traits and quality features which makes our beloved Joomla evergreen.